It's Time for Viggo to Get That Oscar! Thanks to Chrissie for the find on this interview from the Australian magazine FilmInk. 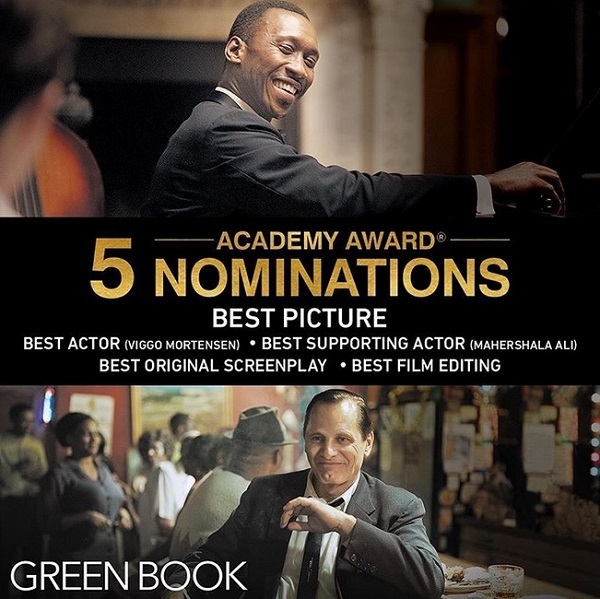 The revered actor plays against type as a tough guy Italian accompanying a black man through the American South in the '60s in the highly acclaimed Oscars frontrunner Green Book. "What you hope is that someone who displays ignorance will eventually find a way to recognise it, or, through circumstances as it happens in this story, will help him recognise that in himself," Viggo Mortensen told us during press duties for Green Book. "But ignorance is not the domain of the illiterate, the uneducated, the untraveled. Someone like Don Shirley [the aforementioned black man played by Mahershala Ali], who has three doctorates and speaks many languages and has travelled and lived all over the world, can also be ignorant. President of a university, the prime minister – I mean, people can be wilfully ignorant or just ignorant. "Don Shirley certainly is ignorant to some degree about the kind of family Tony comes from and certain human qualities which that social environment gives you in parts. "He's ignorant, until they spend time together, about the fact that Tony does actually have a sense of decency, a code of ethics, is someone that you can count on, a man's word and so forth. And, surprisingly, for example, not someone who has deep-seated homophobic sentiments based on experience. How do you get past ignorance? You get past with experience. And, in Tony's experience, he's run across performing artists and people in his line of work in nightclubs that are gay, and they seem fine. It's like whatever. "So, he's not afraid of it. And mostly people are hostile toward – and most people set themselves apart from, or above – what they don't know anything about. They're afraid of the unknown. That's the eternal problem, and that's not something that ever goes away. Some people lament the fact that here we are so many years after the Civil Rights Act, and even though, in general, in society, the word 'n' is not used, and there are no sundown town laws on the books, for example, and it doesn't matter what colour you are, you can eat at any diner, be served at any gas station at any part of the country…. "There are still a myriad of problems that have, in their intent, racial discrimination. Voter suppression. Gerrymandering. All kinds of very subtle ways that people are still playing on racial stereotypes, or trying to marginalise certain parts of society. It's not just black people, it's Native Americans, and others. Obviously, that kind of discourse, if you can even call it that, that we've heard in recent weeks about the caravan and the characterisation of Central Americans, the dirty, unwashed, dangerous criminal… All the kind of stuff. "It's not just casual. It's very intentional, obviously. Sometimes these things happen, but it's never going to go away. That's not something to feel defeated by, neither is death going away. It's like, 'Hey, we're all going to die'. If you choose not to ever think about it until you're getting close and you freak out, that's your decision. But I think about it, and I try to do something about it. I don't have much choice – well, I have no choice. But I tried to make the most of life and appreciate what's happening now because it's not going to last forever. "In that same sense, hatred, ignorance basically, which causes so many problems, is always going to have to be dealt with. I think that each generation, each new generation of little children, infants, tends to play together without a thought to the colour of someone's skin, or whether they have all their limbs, or whether they can see, whether they can speak, whether they can hear, whether they speak a language different than your own; kids just play. They don't even think about it. And then somehow, from their families, from their environment, from society, they learn to differentiate, to exclude, to feel superiority or inferiority, to make a big deal of differences that they, before, didn't give any thought to. And each generation has the possibility, if they're fortunate, if they work at it, to unlearn that and learn to play nice. You know, like they did when they were little, instinctively. That's always going to be there. "So, stories like Green Book are always going to be timely. Useful. Especially when they're well-told, and in the case of Green Book, when they're extremely entertaining, very well-structured, well-written, well-directed, while you're laughing, you're moved, you're invited to think and feel, not told to, just invited by virtue of the quality of the story and storytelling. It does so much for you." © FilmInk. Images © Universal. The film also took a top prize at the Golden Globes this month, winning in the Musical or Comedy category. That puts it in the driver's seat for the Best Picture Academy Award next month because there aren't many better harbingers for the Oscar than the film that wins the PGA's top honor. How accurate is it? In its 29-year history, the PGA Awards have synched up with the Oscars on 20 honorees. It would be 21 if you count 2013, when 12 Years a Slave and Gravity tied for the top PGA prize, with the former going on to score the Oscar. © MSN. Images © Getty.